Efficiency The Eaton 5PX provides industry leading efficiency of up to 99 percent. Energy metering The 5PX meters energy consumption right down to the outlet segments. 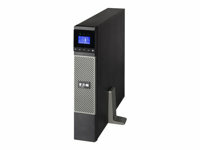 No other UPS in the industry offers this capability. UPS management By integrating Eaton's free Intelligent Power Software Suite, you can monitor and manage the power devices on your network. 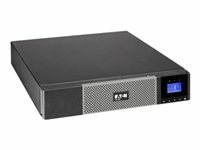 LCD display Eaton's next generation LCD offers a graphical interface which provides all critical UPS information in a single screen view. The user friendly menu allows you to view information and control settings at the push of a button. More power The 5PX protects more devices by providing 28 percent more wattage compared to traditional UPSs. Battery life Eaton's exclusive ABM technology increases battery service life by 50 percent. ABM uses an advanced, three-stage charging technique and closely monitors battery health to provide advanced notice when batteries need replacement. 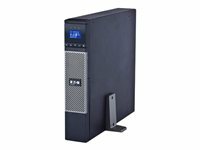 Description: The Eaton 5PX Rack Tower UPS provides line interactive backup power and scalable runtimes for servers, storage systems, VoIP gear and network equipment. With a next-generation intuitive LCD display, energy consumption metering down to the outlet group level, and up to 99% efficiency, the 5PX is the perfect UPS to protect modern IT equipment.